The annual Classified Leadership Institute (CLI) focuses on effective classified participation in participatory (shared) governance processes, both state-wide and at the local district and college levels. Participants attending the CLI conference will explore numerous events that encourage personal development, leadership, and strong communication skills, leading toward increased confidence, enhanced professional skills, and broad-based knowledge of our California Community Colleges. Activities include both interactive and informational sessions with ample time for networking and workshops where newly acquired skills can be utilized in a supportive environment. CLI is designed to meet the educational needs of today's California Community College Classified Staff. Early Bird Discounts - $25; Register prior to March 31, 2014. Presenters Discounts - $50; Consider presenting a workshop at CLI 2014. Please fill out the Call for Proposal form. 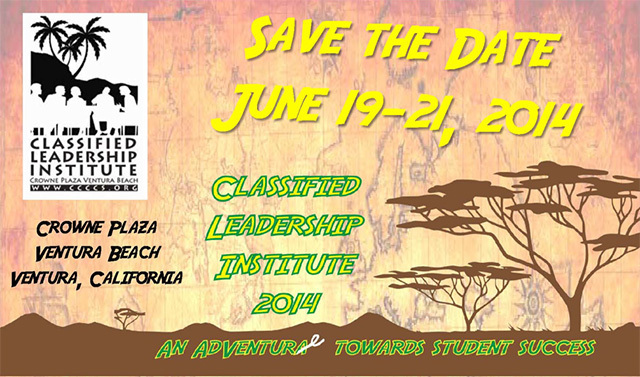 Scholarships are available through 4CS - Scholarship applications to CLI 2014 are available now! Conference Registration Fee includes all conference activities, deluxe room accommodation if needed for 2 nights and most meals (attendees responsible for Thursday dinner - not included). To reserve rooms for additional night(s) prior to or after the conference, attendees should contact the Ventura Beach Crowne Plaza directly and request the Community College League room block. Additional room nights are $120.00 per person/per night. We regret to share with you that the conference site has informed us that the government rates for hotel rooms has gone up from $84 to $120, causing the overall rates for the CLI 2014 to be suddenly increased. Lodging and the access to the facility's meeting rooms, which is directly linked to lodging of participants, is the major expense for for successfully providing the conference. Please see the corrected (revised) SAVE THE DATE FLYER now posted on this website. Please accept our apologies for this late notice on this change! We are extending the deadline for the Early Bird Discount Rate to compensate for some of this additional fee. Consider applying for a CLI Scholarship to attend if needed. Over the years we have worked to keep the cost of the conference as low as possible, yet provide a valuable, educational, exciting and fun event for classified staff to benefit from each year. Please share this information with your classified colleagues. Thank you.